Story wraps around the multiplayer experience for the first time in the franchise. 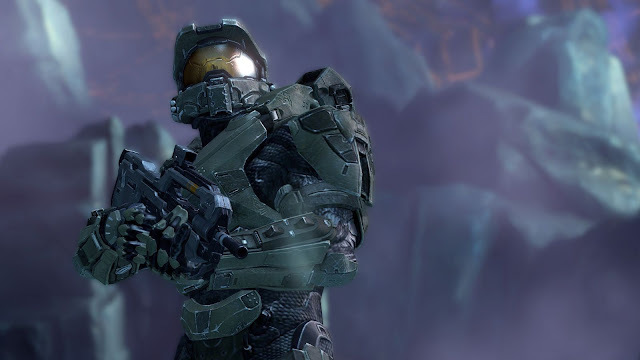 Players now control Spartan IV’s, which promise to be just as powerful as Master Chief. There is a reason why red and blue soldiers are killing each other. Beyond the typical cosmetic customization options, players will be able to augment their Spartan IV’s abilities and weapon loadouts, altering their gameplay styles for the first time. A lot of focus has gone into giving players a better sense of weight. Audio design has been much improved and really gives a player a sense of where shots are coming from. Maps have been built from the ground up. The Battle Rifle is back and has been redesigned. Two maps have been announced so far: War House and Wrap Around. War House takes place in a civilian manufacturing plant that is travelling in a near space orbit above a gas giant. It has a large decorative Cyclops Mark II mech in the center which serves as the focal point for this slayer style map. Wrap Around is another small slayer style arena, set in a Forerunner facility, that contains catwalks, ramps, and plenty of man-cannons to keep the action fast and frantic.